I had been camping in Joshua tree... Wait, let me back up. I was drinking pumpkin buttered rums warmed over an open fire followed by "sleeping" on a rather expensive but lacking in air "air mattress" near Joshua Tree National Park. I awoke the next day to the bright desert sun and a burning desire for bloody marys. You see, I happen to have the type of skin that hates hot, dry weather. As an adult, I am plagued by that annoying condition most often reserved for infants and the like: the prickly heat. And this last weekend was no different. So as The Celery Stalker and I began to pack up camp, the woozy itchiness of a desert hot November day set in, and I needed a bloody mary. Palm Springs was my oasis. We arrived at Pinocchio in the Desert amidst a long parade and what looked like a long, long wait. The sun beamed down as we waited outside, but tables turned quickly and we soon reached our shaded retreat. Seated in the furthermost corner of the restaurant, I quickly realized the heat had taken me over. With no breeze or a/c, the air stifled. I became light headed and flushed. I reached for a tall glass of water, but that just wouldn't do. Finally, my bloody mary arrived. Large and in charge, the giant goblet of drunken tomato goodness promptly soothed my woozy woes. Full of vodka with a moderate spice, the flavors were mild but welcoming on a hot day. I was happy to see a celery stalk garnish and a lemon slice to brighten the mix, and the olive wasn’t half bad either. Though not overly special in terms of flavor or garnish, the mere size is what matters. One comes here to get drunk, and drunk they will be. At only $5.95 a pop. 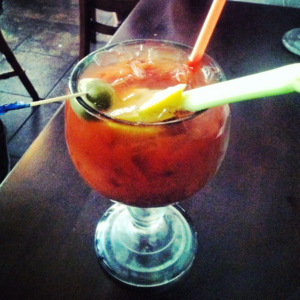 For a very vodka filled bloody mary, Pinocchio in the Desert earns 2.5 Celery Stalks. Post Script: For those in need of a champagne brunch, Pinocchio also offers bottomless Wycliff brand champagne for $3.95 each and every day of the week. And their egg burritos are enormous. Pinocchio in the Desert 134 East Tahquitz Canyon Way, Palm Springs, CA 92262. T:(760) 322-3776.